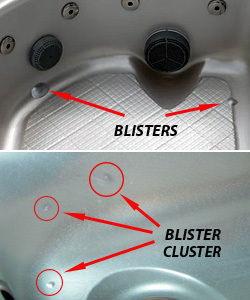 Blisters are round or oval bubbles on the surface or finish of a spa shell (rarely on a bathtub). Blisters were first experienced in the marine industry on the surface of gel coat/FRP boats. 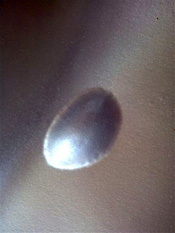 Technology was developed to solve the boat hull surface blisters, and it was adopted by spa manufacturers in the 1990’s. Today, blisters are a rare occurrence considering the thousands of spas built each year. They occur due to the formation of fluid pressure in a void space behind the surface in the composite reinforcement. They range in size from a dime size to the size of a plate or saucer. The average blister being about the size of an egg. There are multiple potential causes of the voids and the fluid pressure. Most blisters, when opened, are found to contain a colored liquid (mostly water). The prevailing belief on the cause of blister formation in acrylic/FRP products is that water reacts with the components of the polyester resin, and creates pressure that blows the bubble. There are multiple sources for water entry into the FRP structure. Permeation through the acrylic surface and in rare occasions condensation in the spray equipment are two causes. The fact that blisters are predominantly found below the water line in spas, and are rare in bathtubs, support the hypothesis that long exposure to water is probably a key requirement for blister formation. Although we know of no rigorous scientific testing to investigate the effects that different parameters have on blister formation, the prevailing opinion about the mechanism would indicate water chemistry (pH, etc.) might affect the rate of blister formation. 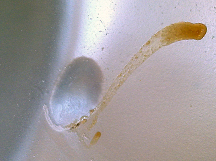 The primary corrective actions taken by manufacturers to minimize blister potential are the use of non-corrosive vinyl ester resins as a skin coat, and the use of higher quality polyester resins and improved equipment and techniques for spraying and lamination. Specifically, some of the actions required to minimize blister issues are avoidance of air pockets and other contamination, dehydration of spray system, resin recipe control, and close control of resin and ambient temperature and humidity conditions. NOTE: You can refer to our section on Technical Information for more details on Theory of Spa Blister Formation. Multi-Tech Products Corporation repair systems can be utilized to repair blisters in acrylic surfaced, fiberglass resin reinforced spa shells. Blisters also occur in spas reinforced with polyurethane. These blisters are caused by a reaction of water with an isocyanate, which produces carbon dioxide gas. Call MTP @ (800) 218-2066 for information on how to repair these blisters. Since most blister voids have water in the repair zone, the first step toward a durable repair is to eliminate this fluid. Before starting a repair of a blister, review and understand the procedures for sealing and eliminating the wet fluid prior to making the final repair. Go to our Technical section and read (download) the procedures that are applicable. These include the preparation procedure and the final repair procedure for the specific color and coating system (MMA, Quick Glaze, or Granite). You can refer to our Color section for determining the correct color description. It is also helpful to understand the difference between Blisters and Delamination. As a Repair Professional, you will often need to provide information to the customer and to the product manufacturer or dealer, especially when the product is under a warranty. We will provide information to help you through this process. WHAT TO SAY TO THE HOME OWNER? WARRANTY REPAIR - The manufacturer should be consulted prior to discussions with the spa owner to determine their policy and recommendations. It is helpful for the Repair Pro to understand the manufacturer’s surface warranty. In most cases, the manufacturer’s customer service representative will handle all sensitive discussions with the customer. Also, costs and billing issues will be negotiated between the repair contractor and the manufacturer without participation from the customer. What will the Manufacturer need from the Repair Pro? Signs of abuse, such as surface discoloration and location, and/or cracks/crazing and location. Pictures might be requested. May need to confirm serial number, model, color, purchase date, dealer, etc. May ask for a warranty on your repair – however, since you should understand the causes and mechanism, you should not volunteer a warranty against new blisters. Your approach should be that you will use materials and procedures that have been proven to be the best available. Furthermore, they have shown to halt new blister formation in the majority of applications. Since your repair will focus only on a small repair area, there is no guarantee that the same conditions that caused these blisters are not still present somewhere in the composite structure, and will result in new blisters. However, experience shows that as a spa ages, blister formation declines. A suggestion for an example of a minimum warranty is: 1-3 egg size blisters – 1 year against bleed through and finish defects. Size and area of the blisters will impact the type warranty given. A few dime size blisters in a small area would justify this warranty. Several large, softball size blisters would be too much to qualify. Here are some claims and questions some manufacturers use in their resolution of warranty problems. These are a few things to think about and even question your pool or spa company if you have experienced blisters in your composite pool or spa. It is our hope that your spa will not develop more blisters. However, we offer some information below that may help. 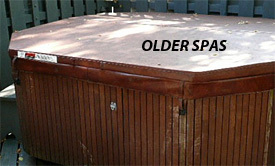 The older the spa, the more likely that some type of outside influence created the blister(s). Sunlight (UV), freezing temperatures, and harsh chemicals are just a few of the contributing causes. This will help prevent several types of problems, including blisters. A factory type of spa cover can be fabricated for a few hundred dollars. 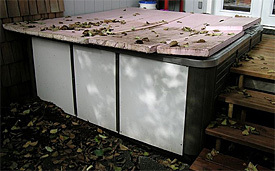 A poorly fitted spa cover or one without insulation can have adverse effects on water chemistry balance. On acrylic spas it is wise to keep direct sunlight from hitting the acrylic to avoid cracking of the surface. Is there visual evidence of chemical abuse? The cover, surface, and jets should be checked for evidence. Different types and brands will react differently in spa water. Also, mixing brands can sometimes lead to problems. Only chemicals designed and recommend for spa use should be used. Check with the chemical manufacturer/dealer and the spa manufacturer for information. Is the spa water chemistry properly maintained? Over-use and misuse of chemicals or the use of non-recommended products, such as pool products, can cause many problems, including blisters. Pool supply retail stores normally provide water analysis assistance. Never let tablet chemicals set on the surface for extended periods. Use water floaters to dispense these chemicals. How often is the spa water changed? Every 90 days? Once a year? This will vary on the amount of usage! Consult the OEM for water chemistry recommendations. PRODUCT NOT COVERED BY WARRANTY - In this case, the repair pro will deal directly with the spa owner. If the homeowner asks about what causes these blisters, the repair pro can attempt to provide a simple explanation. For example, he can explain that blisters are a minor problem associated with spas made from composite materials. Several contributing factors have been found to cause blisters, but most of them involve chemical reactions between water and the composite materials. Manufacturers have learned how to minimize these issues, but they continue to occur at a low frequency. Unless a spa has numerous or very large areas of blisters, they can be repaired very satisfactorily. These repair procedures are very effective in resolving existing and future blister problems, but there is no absolute guarantee that new blisters will not appear on other areas of the surface. To help prevent future blisters, the spa owner may want to consider their water chemistry practices.